The sock in the dryer: Going bananas in Orlando! I just love it when Central Florida makes national news, especially when we are portrayed as idiots (which is not hard to do). 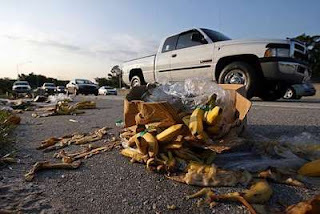 Just as our infamous rush hour was coming to a close this morning, a truckload of bananas found its way all over the east-bound lanes of I-4 near the Par Avenue exit to fashionable College Park. No big deal, right? Accidents happen. Well, that's not what attracted all the media attention. That credit has to go to all the amazing local commuters who put their vehicles into park right there on a major interstate highway to pick up as many armfuls of free bananas as they could carry! Come on, folks! They only cost 49-cents a pound at the Winn Dixie! Stop holding up traffic!! How embarassing . . .